Any teacher that’s worth his or her salt wants to impact their students in a meaningful way. To make a significant difference in their lives. Sometimes we see our impact right away. Other times the seeds we sow don’t produce any results until years later. And we may or may not even know about it. Either way, the time we have now is invaluable, and we can make a lasting impact with our words and actions. Here’s a few things to keep in mind. And come to think of it, these work for parents as well! Build relationships. The more our students know that we care about them, the more they will be open to our help and advice. Show them you care by helping them as much as possible, complementing them, and showing interest in their lives. And parents – don’t think that just because you see you kids every day that you’re building a meaningful relationship with them. We have to be intentional about this. Ask lots of questions – meaningful ones. Show that you care and understand. And take the time to really get to know what your kids are thinking. Seek first to understand. When there’s a disagreement or a discipline issue, don’t launch into lecture mode. Instead, start by trying to genuinely understand where the student or child is coming from. This means we need to ask good questions and patiently wait for their response. Listening and understanding their point of view first will allow us to understand and respond to the real issues. This will not only make us more effective but will also help them feel understood. As a result, our words will be much more likely to make a lasting impact on their hearts. Speak the truth in love. Both parts of this are so important. We must not skirt the truth. Our students and children need to hear the truth, even – no, especially – when it hurts. But we absolutely must speak the truth in love. Walk them through the scenario and patiently explain your reasoning. Avoid yelling and screaming whenever possible – that’s probably just going to make your words bounce right off instead of taking root in their hearts. Don’t charge a gray hill. There are times when a situation is unclear – when you’re not exactly sure what exactly happened or if anyone should receive a punishment. Sometimes these situations are worth getting to the bottom of, but often they are best left alone. There will be plenty clear situations to confront, so we don’t need to take on battles that we’re not really sure about in the first place. Pray and seek wisdom. Above all, we must seek God’s help. We must be close to Him and know His heart. We must seek wisdom through His word and His people. He often speaks through others, so make it a habit to seek our advice and wise counsel. We cannot do this alone. What else do you believe contributes to leaving a last impact on our students or truly reaching the hearts of our children? Share your thoughts with a comment below. Book: Create Your Dream Classroom: I talk about these and other concepts in more detail in my book. Post: Why Do Kids from Good Families Walk Away from the Faith? It is all about the relationships you build with your students. 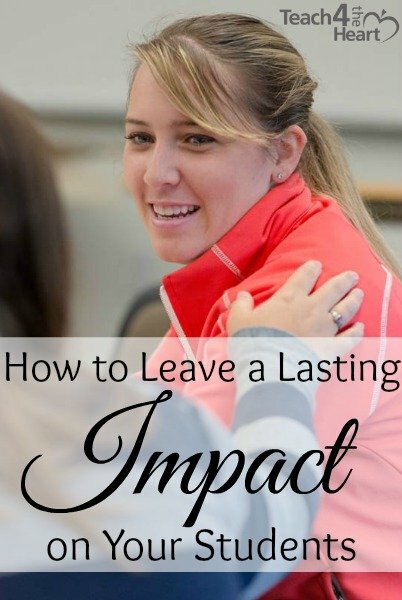 Acting with their best interest in mind and genuinely trying to help them better themselves as a person and student, can have a lasting impact on their lives. A teacher is the inspiration of the students, the student always wants to be like his teacher. Be good with students, this gives the best impression to students. Always provide the right information and best knowledge to students. If they need extra classes then, help your students to get good grades.